Araki Takako is an internationally acclaimed ceramic artist, particularly well-known for the "Bible" series on which she has been working for more than twenty years. Araki is an atheist, but her father was a Zen priest. The prolonged and painful death of her brother, a faithful Christian, from tuberculosis, focused her doubts on the value of religion. She sees the bible as both a symbol of Western culture and a symbol of the vanity of Christian belief. Her obsessive metaphorical work sparked by her brother's death serves as an eulogy on the powerlessness of faith. 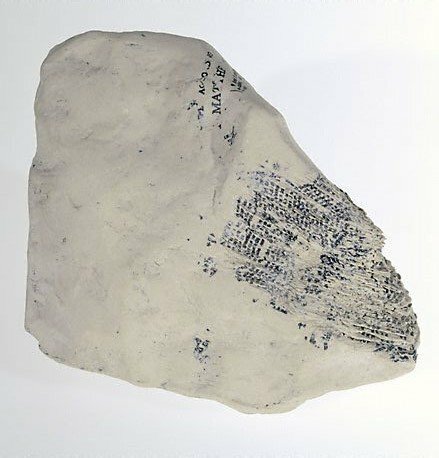 The brittle decaying Bibles are composed of layers of thin fragile clay sheets which she has silk-screened with text. Their decaying fragility contains its own message that ultimately the Word is ephemeral. Araki devoted herself to the family profession of flower arranging until 1952 when she began to study painting. From 1960 to 1961 she studied sculpting in New York before returning to Japan where she studied in different pottery centres. Her reputation for sculptural ceramics was established in 1979 when she received the grand prize at the Japan Ceramics Exhibition. Jackie Menzies, AGNSW Collections , 'Asian Art - India, South-East Asia, China, Tibet, Korea, Japan', pg. 173-228, Sydney, 1994, 228 (colour illus.). Art Gallery of New South Wales: highlights from the collection , Sydney, 2008, 179 (colour illus. ).